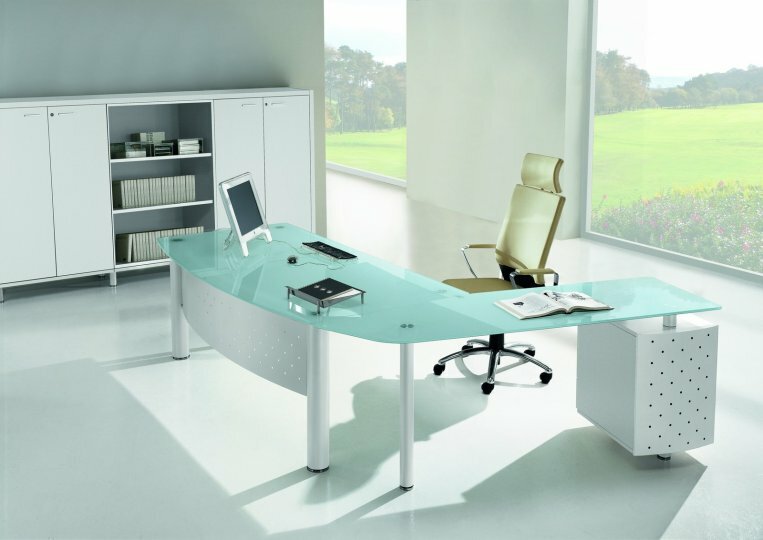 Executive glass office furniture from the XT range. Front legs are 100mm cylindrical and the rear legs are 60mm. Each leg has a 10mm thick circular chrome foot with integral levelling. The integral modesty panel is available in perforated steel in a powder coated silver finish. Glass is 12mm thick frosted tempered safety glass. The XT ranges of executive office furniture is manufactured to stock and delivered flat packed for easy assembly.We can also install this furniture if required. We support this range with our free interior design and space planning service. Please contact our design team to discuss your requirement or project.